India bounced back from 2008 crisis thanks to stimulus packages, but faltered by letting these continue. And it still has a long way to go in ensuring greater coordination between govt and financial regulators. India did not have a rulebook to refer to a decade ago when it was hit by a seismic shock with its epicentre some 12,500 km away. In the initial days post the Lehman collapse on September 15, 2008, many in the government did not think much of the crisis. The growth euphoria of the previous years had led to a widespread notion that the Indian economy was decoupled from that of the developed world. But within a fortnight, then Finance Minister P Chidambaram had to re-engineer an aircraft that was flying high. Manmohan Singh, the Prime Minister then, was to Chidambaram what P V Narasimha Rao had been to him during the 1991-92 crisis. He has not got due credit for steadying the boat, and ensuring a quick recovery. But soon enough, India faltered. READ | Non-Performing Assets: When and how did banks pile up such bad loans? High-growth periods have a tendency to obfuscate facts. Since the Asian crisis of 1998, India has integrated more and more with the global economy. In fact, the high — almost double-digit — growth rates recorded during the four years from 2004-05 to 2007-08 were also a period when the global economy rode a crest, growing an average 4%-plus in calendar years 2004 to 2007. India’s stellar performance was aided by a boom in exports, which jumped an average 25% every year on the back of robust average global trade growth of 8.6%. In 2009, global trade dropped 11%, and India’s exports plummeted 16%. Over the decade since the crisis, India’s dependence on international trade has not waned much. Its two-way trade (exports plus imports of goods and services) as a percentage of the GDP hit a high of almost 56% in 2012, before dropping to 41% in 2017. 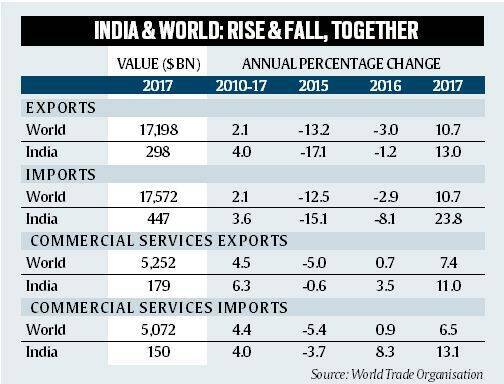 Trade data since 2010 suggests that India does better than the world when world exports in goods and services are rising. We live in a connected world. A credit squeeze or a withdrawal of credit from the global markets will hurt the country irrespective of its credit-worthiness. India took unprecedented action in the months following September 2008. The RBI required some initial prodding by Planning Commission Deputy Chairman Montek Singh Ahluwalia and Chidambaram, but once it was clear that India would not emerge unscathed, and the crisis could wreck the India Shining story, all hands were on deck. The government announced three stimulus packages in the space of three months between December 2008 and February 2009, totalling Rs 1,86,000 crore or 3.5% of the GDP. 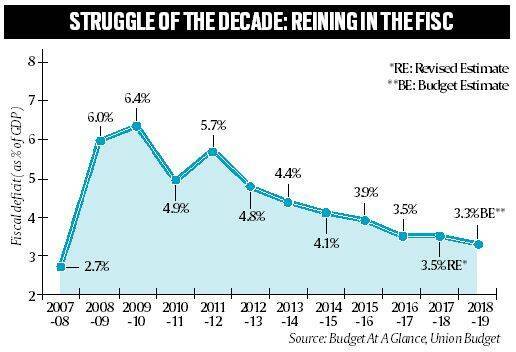 After doing better than what the Fiscal Responsibility and Budget Management Act had required in 2007-08, India’s fiscal deficit touched 6% of the GDP in 2008-09, from being just 2.7% in the previous year. Over seven months between October 2008 and April 2009, the RBI eased monetary conditions dramatically. Its unorthodox measures made available a whopping Rs 5,60,000 crore (about 9% of the GDP) in domestic and external liquidity. The government continued with the stimulus in 2009-10 too, and the fiscal deficit touched 6.4% of the GDP. The economy staged an impressive rebound — from 9%-plus in the previous three years, it dropped to 6.7% in 2008-09, then bounced back to 8.5% in 2009-10. This is when India faltered. The government did not close the tap. The fiscal stimulus was never withdrawn. On top of it, India let the current account deficit swell. India is yet to recover from this. Ten years later, the fiscal deficit continues to hover around 3.5% of the GDP, and the current account deficit for the first quarter stands at 2.4% of the GDP, creating a new set of problems. However much credit India gets for a sharp recovery from the biggest crisis that hit the world since the Great Depression of 1930, a lesson it did not learn was to budget for greater coordination amongst financial sector regulators, and between the regulators and the government. The government set up the Financial Stability and Development Council (FSDC) in December 2010 that would settle disputes among regulators and deal with issues including financial stability, financial sector development, inter-regulatory coordination, and macro-prudential supervision of the economy including the functioning of large financial conglomerates. The FSDC has met 18 times over eight years, but has little to show in terms of settling inter-regulatory issues, especially when certain financial market products fall in the domain of more than one regulator. That FSDC has not meant much shows in the fact that the financial sector has witnessed little product innovation over the years. Regulators not only hold on to their turfs, but would also rather want to play it safe. Yes, FSDC was an innovation resulting from the global crisis, but expedited more because of a public war between the capital market and insurance regulators over unit-linked insurance products, than because of the need to be alert and prepared for the next crisis. After being notified, the FSDC office should have been housed independently, not in the Finance Ministry, as it is now. It should have had an independent research team drawing from global experiences, and aiding regulators in decision-making. There have been at least three major crisis-like situations since: one, arising from a ballooning current account deficit in 2013; two, the non-performing assets that have choked the banking system, and three, the rupee slide triggered again by concerns of rising current account deficit. Had the FSDC’s crisis management team being doing its job, the meetings may not have reached Lok Kalyan Marg. 3 Non-Performing Assets: When and how did banks pile up such bad loans?